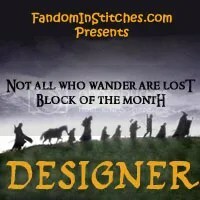 Between Heaven & Texas Blog Hop, Free Pattern and Giveaways! 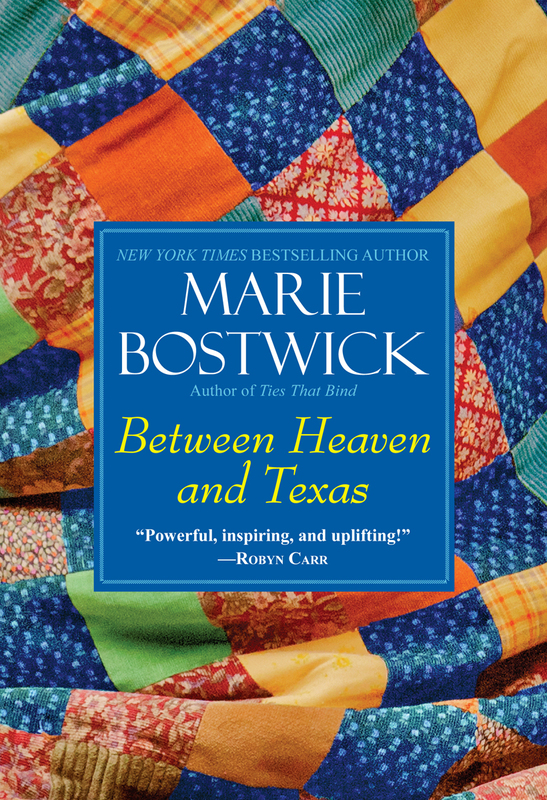 Welcome to Sewhooked and the Between Heaven & Texas Blog Hop for Marie Bostwick‘s newest novel by the same name! 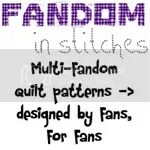 Each blog participating in this fun event is sharing a free 12″ star pattern made in a variety of techniques. You’ll find mine below. 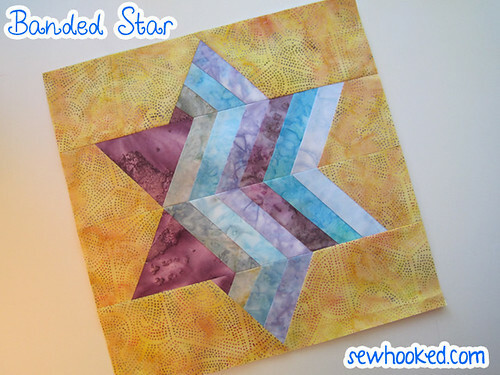 Banded Star, a pattern to paper piece! 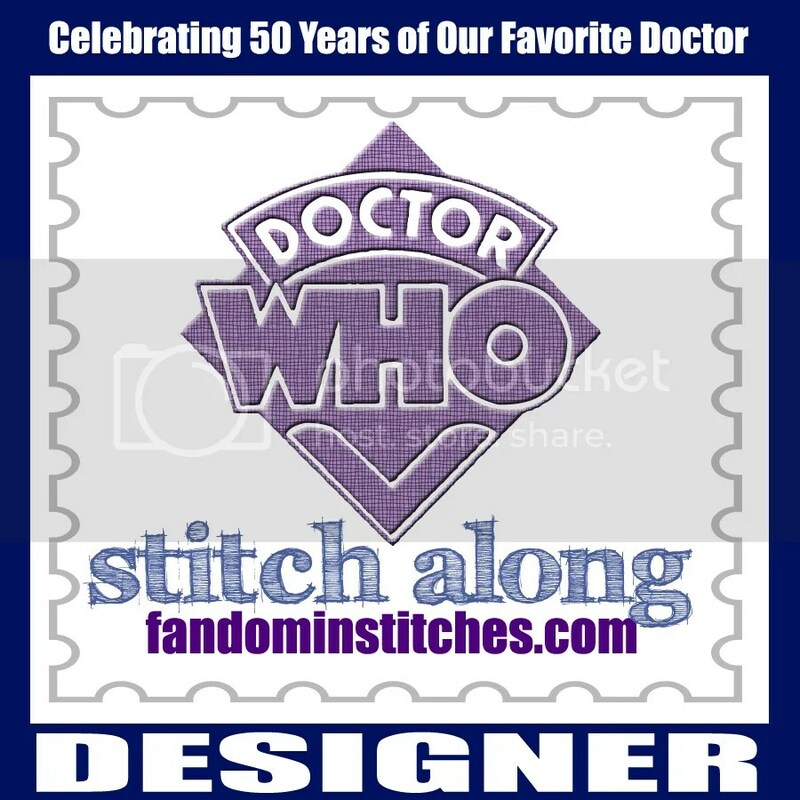 ..and because I can’t help myself, here’s the 6″ pattern! This is an extra special post for me because just a couple of days ago, I had the opportunity to meet Marie in person at my local quilt store. 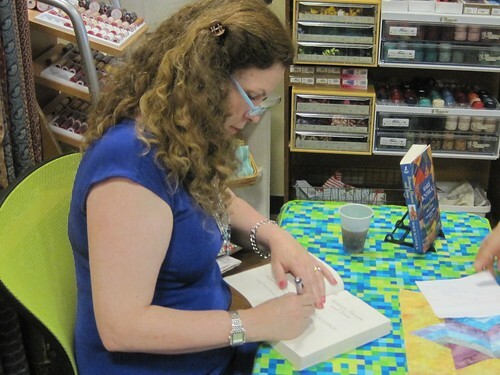 She was signing copies of her books and very generously agreed to sign giveaway goodies for the blog hop! As one of the bloggers for this special event, I received an Advanced Reader’s Copy of Between Heaven and Texas. This is Marie signing my copy. For you. That’s right, I’m giving away my autographed copy! Woo! 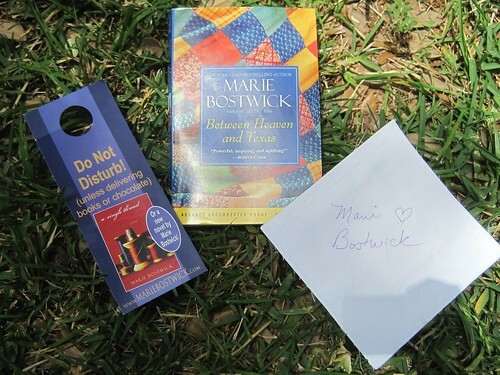 In addition to the autographed copy of Between Heaven and Texas, I will also be giving away a brand new copy of the book, straight from the publisher, a door hanger from Marie’s book signing tour AND, possibly my favorite thing, a 6 1/2″ signature block, signed by Marie! Winner to be announced Tuesday, May 14. You must include contact information to win. The book coming directly from the publisher can only be shipped to addresses in North America. Sorry, their rules! Marie signing the block to be given away here on Sewhooked. Do you see my Banded Star peeking out?! Marie showing off one of her quilts. 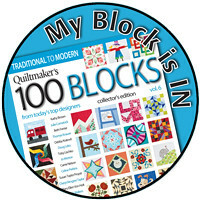 Be sure to visit all the wonderful bloggers participating in this fun event for free star blocks and great giveaways! Monday, May 6 – Victoria – Bumble Beans Inc.
Find all the stars here with direct links to each Blog Hop post. 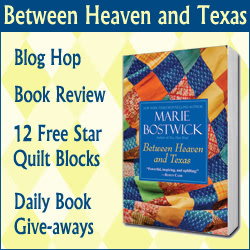 Between Heaven and Texas Blog Tour Flickr Group…makes blocks and share your photos here! 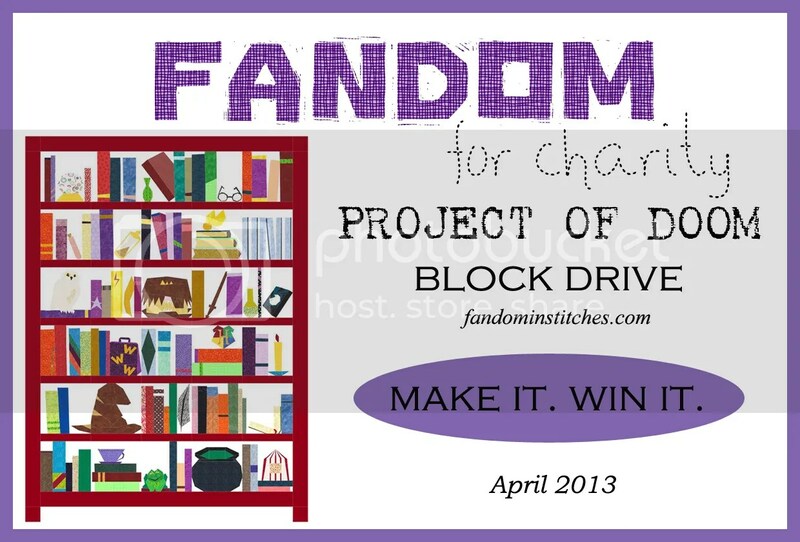 Want to help out a great cause while enjoying the great free patterns from Marie’s Blog Tour? Make an extra star block and donate it the The Linus Connection! 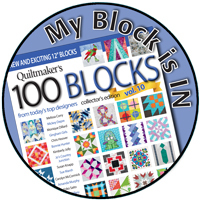 Any and all 12″ star blocks are welcome! I have been an active volunteer for The Linus Connection for over 10 years. 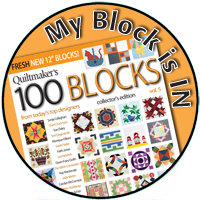 To date, I have made and donated approximately 300 quilts and blankets since 2002, many of them made from orphan blocks donated by quilters from around the world from generous quilters like you! 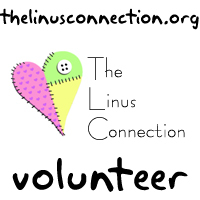 The Linus Connection is a 501(c)(3) organization based in Austin, Texas whose mission is to make and deliver handmade security blankets for children in crisis situations in the Central Texas area. The blankets go to children in hospital emergency rooms, in crisis centers, in foster care, battered women’s shelters, to any child who is in need of a little extra security in their lives. Contact me for mailing information at sewhooked@gmail.com or visit The Linus Connection blog to find out other ways you can help! Welcome to Too Much–where the women are strong-willed and the men are handsome yet shiftless. Ever since Mary Dell Templeton and her twin sister Lydia Dale were children, their Aunt Velvet has warned them away from local boys. But it’s well known that the females in Mary Dell’s family have two traits in common–superior sewing skills and a fatal weakness for men. While Lydia Dale grows up petite and pretty, Mary Dell just keeps growing. Tall, smart, and sassy, she is determined to one day turn her love of sewing into a business. Meanwhile, she’ll settle for raising babies with her new husband, Donny. But that dream proves elusive too, until finally, Mary Dell gets the son she always wanted–a child as different as he is wonderful. And as Mary Dell is forced to reconsider what truly matters in her family and her marriage, she begins to piece together a life that, like the colorful quilts she creates, will prove vibrant, rich, and absolutely unforgettable. 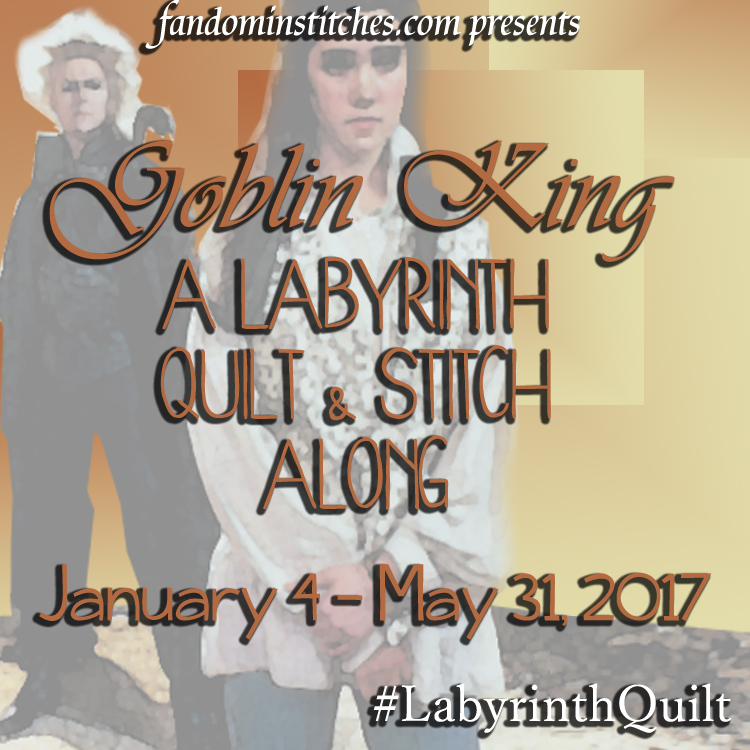 . .
Marie Bostwick is the New York Times Bestselling author of eleven books, including the popular Cobbled Court Quilt series of novel. She lives in Connecticut with Brad, her husband of thirty-one years. When not writing or volunteering for her church, she enjoys quilting, gardening, reading, watching movies, spending time with her friends and family, and especially playing with her grandsons. 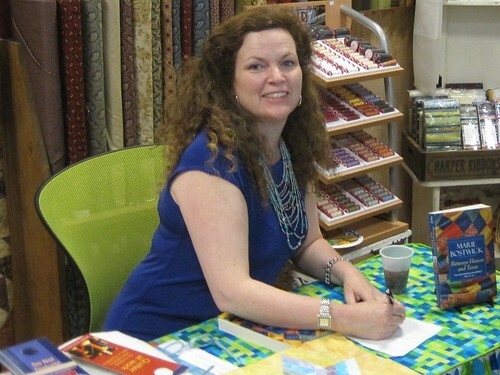 Marie travels extensively, speaking at libraries, bookstores, quilt guilds, and at quilt shows. 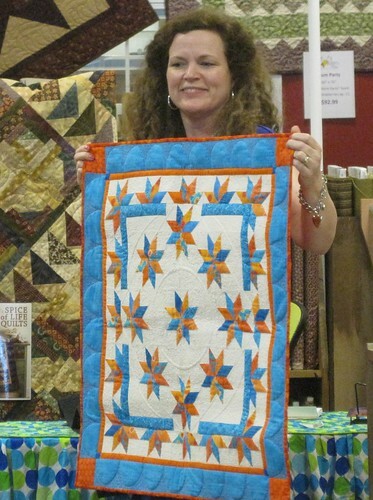 She has been a featured speaker at the Paducah Quilt Festival and the Houston International Quilt Festival. In 2013, she will be the keynote speaker at Quilt Nebraska. Look for me on pages 10 & 33! I have a limited number of copies available in my ETSY shop. Doctor Who? 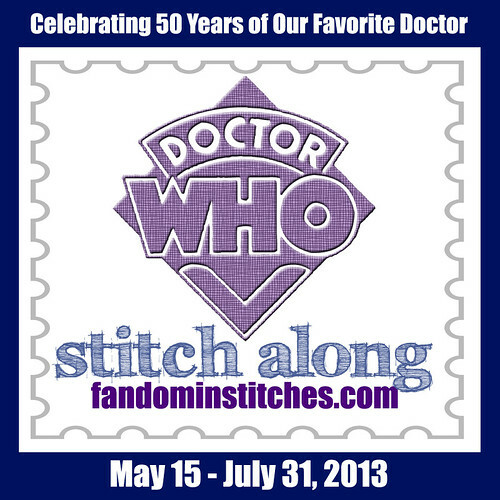 Stitching? 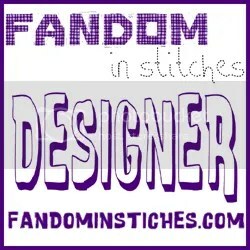 Free patterns? What’s not to love?! Only on Fandom In Stitches! We’re giving away a quilt to support The Linus Connection! Click the banner for details! 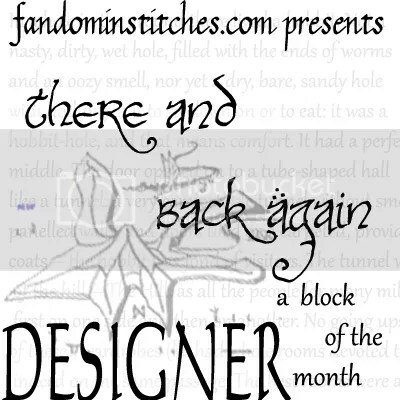 This entry was posted in Blog Hop, Events, Free Patterns, paper piecing, Quilting Gallery and tagged between heaven and texas, blog tour, marie bostwick, quilting gallery on May 9, 2013 by Jennifer Ofenstein. Ah, thanks, Michele! It was a blast meeting her! I’ve had the opportunity to visit Texas a couple of times and hold an event at the home of the Dallas Cowboys. Visited friend in McKinney years ago. Also had a wonderful outdoor BBQ at a ranch. I live in Illinois. Love your block. I only stopped in Texas on my way to and from an adventure as an exchange student to Mexico many years ago. What I remember is extreme heat as we paraded through a customs building way out on the tarmack! I’m sure there are more pleasant places to visit in Texas than that! I am a Michigander born and raised! I was born and raised in San Antonio, TX and left to travel the world with my husband that was in the Army for 26 years. We returned to San Antonio, TX in 2001 and now live in Converse, TX just outside of San Antonio. Love that Marie’s new book is set in the great state of Texas! I’ve never been to Texas, perhaps one day! I live in Calgary, Alberta, Canada. People have cattle ranches here, and Calgary is where our oil companies have their headquarters. Just two things we might have in common! Thanks for the great star, I’ll use it definitely! I have been in Texas. In the late 80’s I was in Houston for the rodeo at the AstroDome. I did back-stage catering for the entertainers as a work study from college with the Harry M Stevens group. I liked what I got to see, but there was not much from the apartment to the Dome. It was a great time and a great experience. Would love to come back to Texas. I live in Central New York – and have been here all my life. Thanks for the star – it is beautiful. Thanks also for the giveaway. I’ve never been to Texas, but my husband is in Dallas right now for business. I`ve never been in Texas.You look pretty nice! Texas is one of the states I’ve always wanted to visit, especially after watching the movie classic, Giant. I will get there someday! I just moved to Kyoto last month and am having a blast exploring my new home!
. I live in Tennessee ,I will get there someday!……….. I was born in Texas and I still live in Fort Worth, Texas. 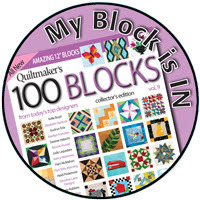 I can’t wait to get started on your block. I have some graded hand dyed fabric that will look awesome in it. Thank you for sharing your block with us. I love your banded star enough to try paper piecing again. 😉 *If* I finish it, I will donate it to Linus! I have visited Texas and think it is a beautiful state. I live in South Carolina. I love your star block, very unique. I visted Texas when we went to visit my mother-in-law in St. Padre Island. It was beautiful but so humid. I lived in LasVegas for fifty years but now reside in Oregon. I have visited Texas – twice! My sister used to live in Fort Worth and my niece is married and living in Austin. Thanks for the giveaway. Hi Judy! You won the autographed block and door hanger! If you could contact me at sewhooked@gmail.com with your mailing information I’ll get that out to you as soon as possible. Congrats! I have visited the big state of Texas. I live in the Volunteer State of Tennessee. I love your action pictures with Marie 🙂 I visited Texas when I was 15 and our high school band marched in the cotton bowl parade in Dallas. Does that count? Wait, just did the math…holy cannoli that was 31 years ago? can’t be…adding again, carry the one…yep 31 years ago. At least the flag had 50 stars it already! Going to get a cup of coffee to counter the depression 🙂 It’s a beautiful state. I think it’s time to visit again! I have never been to Texas but have friends that spend the winter there. I live in Canada in NW Ontario. Thanks for the chance to win. I lived in Lubbock for 8 years– loved it!! Now I live in my home state of Nebraska. Just realized this is where I was supposed to say- YES, I live in Texas! And love it. Sorry I have never visited the great state of Texas. I now live in Pennsylvania. Hiya!!! Nope, haven’t had the pleasure to visit Texas yet, maybe one of these days! I live in a little town in the foothills area of North Carolina. I love your block, so pretty. Thanks for having the giveaway. Blessed be, hugs!!! Hi, I have not been to Texas but I would love to visit. I am from Northern Virginia about 40 minutes outside DC. 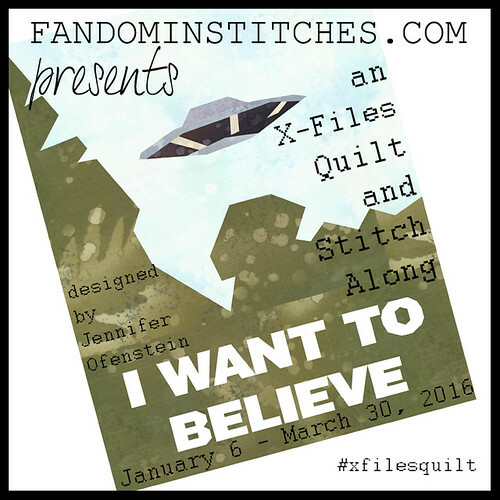 This is my first Blog Hop and I am having a blast! I am enjoying discovering all these blog gems. 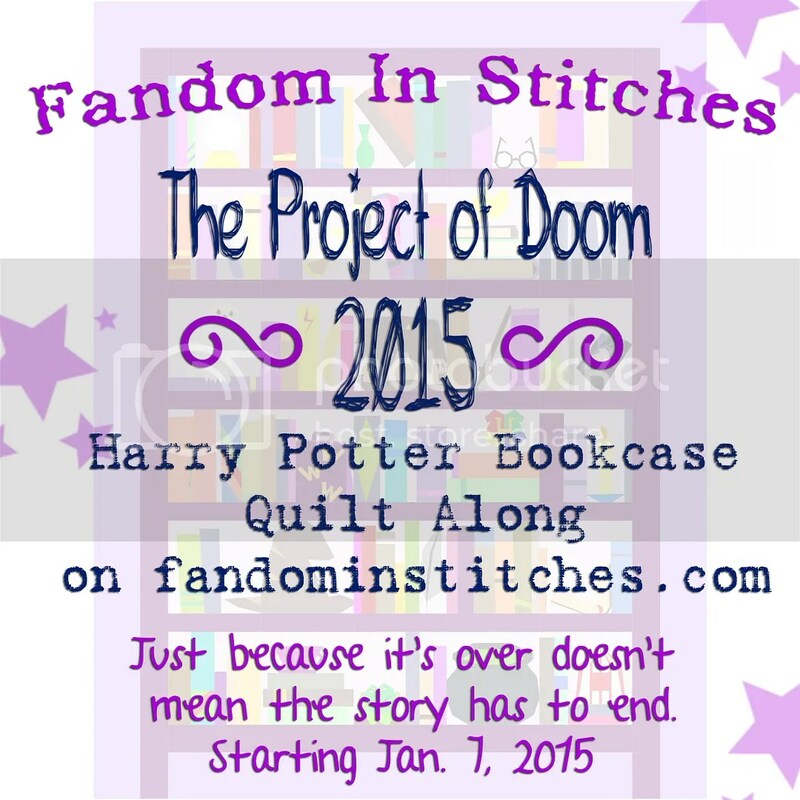 I love your Project of Doom and the Harry Potter bookshelf quilt. That is just so neat! I have signed up to follow your blog. Since I live in Oklahoma, I have been to Texas many, many times. I have family there, so it is a treat to go and visit! I have been to Texas twice. Several years ago I went to San Antonio and enjoyed the Riverwalk and visited the site of the Alamo. I got a gorgeous pair of cowboy boots!! Just two years ago I visited a friend in Dallas. Just love the people of your great state! I also love trying new quilting patterns and learning new techniques from fellow quilters. Thanks for the chance to win. I am originally from Michigan, but I have been transplanted to Del Rio, Tx. since 1986. The summer heat can be too much sometimes, but I love it here! We visited Texas briefly on our way to the Grand Canyon. We are planning a trip back to explore more of your state. I am from Canada. Thanks for sharing your STAR ! I am originally from California and lived in Texas in 1974-1975; first at Lackland AFB TX for Basic Training, and then at Shepherd AFB in Witchita Falls Texas. At Shepherd AFB I met my husband, also a student, and married him 6 weeks later. We were blessed to have been married for almost 30 years. Delaware was the last duty station, and that is where we planted our roots 27 years ago. Never moving again…. You’re a winner! I left a comment on your blog, but if you happened to miss it, you can contact me: sewhooked@gmail.com. Congrats! We live in Calgary, Alberta but we have spent our winters in south Texas (Weslaco) in Hidalgo County for 16 years. We love it there such beautiful balmy winters. The Rio Grande Valley Quilt show is fantastic. Born and raised in Pennsylvania but have lived in Texas off and on since 1965 (military transfers) and consistently since 1975. My kiddos dad was from Texas so we just stayed. That way our kiddos could be around and know their grandparents and aunts & uncles plus the 20+ cousins. It was a good decision. My MIL first taught me to quilt back in 1965 using whatever fabric you have on hand. 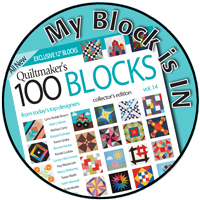 I never heard of quilting until I met my MIL here in Texas. One of the best things about Texas is sometimes in February, when the rest of the country is freezing their buns off, we get to open our windows and enjoy that promise of Spring being on its way. I currently live in Texas. That’s in Round Rock, Texas. And, yes, there is a big round rock in the middle of Brushy Creek, a pioneer landmark. I look forward to reading this new book and making some star blocks for The Linus Connection. I’m from Missouri and have only driven through the northwest of Texas on a round-about way home from our honeymoon 35 years ago this July. I don’t remember much about it, but would love to visit again. My nephew just moved to Houston and am hoping to go visit him and attend the big quilt festival next year. I would also love to visit San Antonio. never been to Texas, would like to go someday. I live in central Florida. Looks like a fun event. I haven’t visited Texas, yet! I currently live in Nevada which is an adjustment coming from the southern Oregon coast ! I have family and friends that that live (or have) in Texas and being married to a Cowboys fan means I’ve been there to visit more than once 🙂 We live in Kansas. I have visited Texas many times since my son and family lived in the Dallas area. I have also visited the Houston area. I have always visited in the fall or spring time so I never experienced the hot humid summers. I am from the central part of Washington State so I am use to hot dry summers. Loved my visits. I have lived in Illinois all my life, but that is soon to change as we move to Alabama the end of this month. I actually have been to Texas several times and have enjoyed visiting the historical sites. Two years ago we visited friends who have moved to texas and enjoyed the sites in and around Austin. Funny question! We were full-time Rv’ers when we came to Port Aransas, for a workamping job on the beach. We finished up that job about 4 years ago, tootled up the coast and around some inland & haven’t left TX yet! Isn’t it interesting how the internet connects people from all over the world! Texas will always mean traveling to Houstin and the Quilt show in the fall. Last year I brought a friend who had never been south of Iowa and introduced her to the quilt show; NASA and the gulf of Mexico. She was on overload by the end of the trip! Our oldest son lives in Austin & we travel to see him & other areas of TX periodically. It’s such a beautiful state! We live in CA, but jump in the RV whenever possible. Hope my name is picked; I would love to win this drawing! I have never lived in Texas! I live in northern Florida now. I’ve visited Texas many times mainly for business. I live in Colorado. 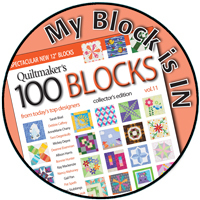 I love your block – would be fun to make a quilt using both sizes. I grew up in Minnesota, got married and moved to Kansas. My husband’s grandparents lived in Ft Worth so we did visit Texas several times before they passed. I live and was raised in Southern California. We did live in San Antonio, TX for a couple of years when I was a toddler. But now my son has moved his family to Austin, TX for more opportunities so we have visited there. More importantly our second grandson is about to be born and he will be the second family Texan (my brother was born there). I had the misfortune to be born in California, but moved to Texas between my 8th and 9th year and have been here ever since in the Houston area. I’m a bout as Texan as I can get now in my 68th year. Been here longer than anywhere else, and enjoyed most of it. There were a few bumps in the road, but on the whole, it’s been wonderful being a Texan as long as I have been. All my children were born here and still live close enough to see them regularly as well. And the grandchildren and great grandchildren are all Texans as well. Yep, I may be a transplanted Texan, but I’m might proud of it. In the ’70’s we traveled to Phoenix and drove through Texas. El Paso was beautiful during a sunset. I live in WI now since 1971. I have never lived in Texas. Live in Wyoming. 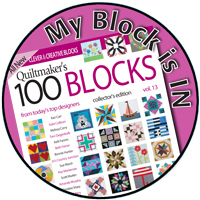 Love your block! Lived in Stephenville TX in late 1987 to 1989 due to my husbands job at the time. That is where our youngest son was born. Live in Missouri. 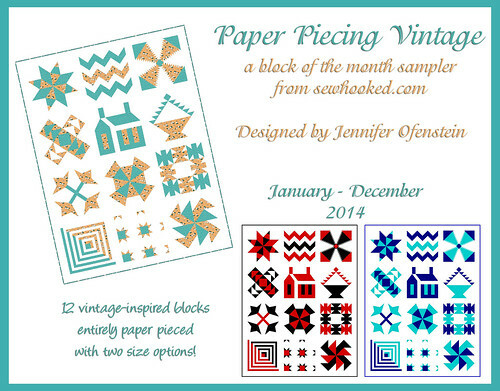 Love your block, just started doing paper piecing and love it. Yes, we used to live in Waco, Texas. We moved there because of my husband’s job and ended up staying 10 years. We decided we wanted to moved back to Colorado to live close to his family. I would love to win Marie’s book. Thanks for the chance to win! I don’t know if you would call it visiting Texas, but my husband and I drove through the panhandle on our way back from visiting my brother in California many year ago. I grew up in Michigan, moved to Indiana then New York and am back living in Michigan although not in the town I grew up in. Your start block is beautiful and is my favorite so far on this hop. Thanks for sharing and the chance to win. Very cute block. I have never been to Texas. Live in Nova Scotia, Canada. My Dad lived near Longview, Texas, until last summer, when he moved in with my youngest sister in Tennessee. We would visit at least once a year, from our home state of North Carolina. I love Marie Bostwick’s books. Thanks for the chance to win. I love your block!! Yes I have been to Texas and love the state, especially San Antonio. I am from New York. I was only in Texas once. I was at an NAEYC (National Association for the Education of Young Children) convention in Dallas so I didn’t see much beyond the airport and convention center, but I did get to eat in a fabulous restaurant. I’ve never been to Texas, but I have a niece living there. Does that count? I just started reading Marie’s Cobbled Court series. I decided that I need to read those first before I get to her latest book. Enjoying it already after just a few pages of A Single Thread. Looks like my summer reading is all set for now. By the way, I live in Michigan. We vacationed there about 35 years ago, and have driven through Texas a couple of other times. Currently live in MN. Hello and thank you for the opportunity to see your beautiful ‘banded star’. I love batiks. I have not lived in Texas, but I have spent some time in San Antonio and that is a great city. I currently reside in Arizona, in the southern area, I am 40 miles north of the Mexican border and 20 miles South of Tucson. My husband, children,and I lived in the Houston/ Galveston area for 15 years. During that time we visited almost every city in the state. Our children are grown now and we are back home in Central Illinois but planning to winter in Texas. I would love to live in the Hill Country and he wants to be in Corpus or The Valley. Thanks for sharing your block pattern. It is the perfect combination for me! Stars and paper piecing !! I’ve visited in Texas once but I’m a native California girl. I have never been to Texas. We live in West CHester, home of QVC> I would love to go to the Houston show someday and do some sight seeing. I’ve visited Austin, Texas twice while my husband was working for an international I.T. company. I had 2 long flights, one from Melbourne,Victoria, Australia to L.A. then L.A. to Texas via the different hub airports you have to get there. So my first impression was of Austin,Texas in the dark but the next day I found it was a beautiful place to visit. Your highways are something to get use to, as down here in Melbourne we only have approx. 2 million people living here. I loved visiting the main street in Austin at night for the Texan food & the Jazz music. We have visited Texas a number of times. We especially like the Gulf Coast. We have relatives in Quitman. We now live in Arizona. I visited Houston 16 years ago. I live in Florida. I live in California. I have traveled through Texas a few times, once making a detour to visit the White Elephant Saloon in the Dallas Fort Worth area. Driving across the state makes you realize it really is BIG! Your blocks are beautiful! Thank You! I have visited Texas several times while going to Quilt Market with a friend. I thoroughly enjoyed my time there, although I didn’t get to see a lot of the interesting and historical sites. I live in Michigan. I have visited my son and family in College Station Texas several times. I am a life resident of Oswego, NY. 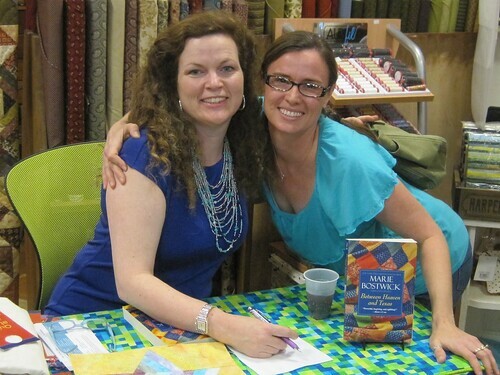 I met Marie last year when she signed books at Calico Gals quilt shop. Lucky you!! You got to meet Marie..I have never visited Texas. I live in AZ., which is just as hot and desert like. Thank you for the chance to win her book. I hope I am lucky. Wow, how great to meet her and get signed copies! I have not lived i n Texas. I am currently living in Pennsylvania. I haven’t been to Texas, but I do plan to visit. I live in PA now. Have lived in the GREAT State of TEXAS for 30 years, 20 in Midland/Odessa and 10 in Houston. We are in the process of building in the Hill Country to retire to! Thanks for the opportunity to win the book! Yes, I lived in Dallas, Texas when I was a young child for about a year while my father attended photography school. We lived in a small trailer park – mom, dad, me and my younger tiny baby sister – we slept in dresser drawers so many years ago now. I live in California now. I live in Seminole, Texas – west Texas – kind of at the bottom of the panhandle on the New Mexico border. We moved here from Maine 3 years ago. I am finally becoming adjusted to the new world of Texas after being a Yankee all these years!! our motor home after we retired. Loved the climate and the friendly people ! I met Marie here in St. Louis a few months ago. She is so much fun to listen to! I have visited Texas many times. I have family there and a cousin just bought a B & B in Brenham last year! Never been to Texas, Jennifer. Yet. Hoping to get to Houston one day. I live in Israel. I do have a U.S. mailing address to provide for when I win! 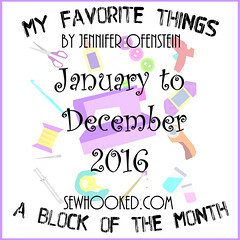 Love the strippiness of your block, Jennifer. You’re a winner…yay! You should have an email from me. If not, please get in touch: sewhooked@gmail.com. I enjoy Marie’s books. They are fun and entertaining…wish she would come to California, that is where I ‘m living currently. I have been to Texas many times, as one of my sweet brothers lives there and we like to go visit. I visited Texas many times-my girlfriend lived in San Antonio-and one year my husband and I traveled from top to bottom of Texas-took us several days-What a Great State-coming back again-Thanks for the memories. I was born and raised in Lubbock, then lived in the Dallas area for 13 years. I now live in Oregon. 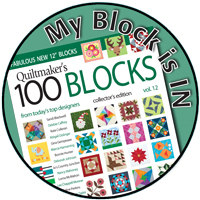 Love the blocks, and I’m already thinking about how to use both sizes in a quilt. I have visited Texas many times over the years. My sister lives in Amarillo and two of my children went to college in Lubbock and my niece lives in the Ft. Worth area. As a matter of fact today I drove through Amarillo on my way to my granddaughter’s graduation from college in Arkansas. I currently live in Albuquerque, New Mexico. I wasn’t born in Texas but I got here as quick as I could. I’m an Army brat and moved to Texas the first time when I was about 3 (Mineral Wells), then left a while and returned when I was 6 (Fort Hood) and then moved to Austin when I was 9. I spent the rest of my school years, through the University of Texas and moved again from Texas. I finally got back 16 years later and plan to stay! Thanks for the opportunity to win a goodie! I’m from California, living in Oregon. I’ve driven through Texas a few times and have stayed in Austin a couple of times. What a great town! I visited Abilene, TX a lot as a child as my grandmother lived there. Now I live in Colorado. 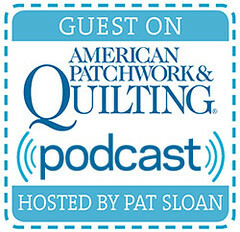 We passed through Dallas many years ago on our travels, then more recently three times to Houston, for The Quilt show. I was born and raised in South Africa and have been living in Israel for the past 21 years. I have never been to Texas. I live in New Zealand, so we are many hours away by plane. I’ve never been to Texas…always been here in California.. I got to spend two weeks in Texas with the Red Cross doing relief work after Hurricane Ike. I spent time in Dallas and Houston. I was so impressed with how nice everyone was! I live in Ohio and am currently reading the book! Really enjoying it. As a preteen I lived in Dallas and thought that Texas was heaven. I had lived in four other states then and have lived in another four since including Georgia where I am now, but I would go back to Dallas in a heartbeat. My quilting daughter and her husband are there with my wonderful grandson who was lucky enough to be born there. I have loved all of Marie’s book and would love to win one. My sister lives in Cleveland and I love to go visit her so that we can go fabric shopping in the Houstan area. She used to live in Katy which I love. So quaint. I’ve never been to Texas, but one of my best friends will be moving there soon so I’m sure I will get a chance to visit. I’ve lived near Chicago my whole life. I have never been to Texas, but my nephew, who is a chef, lives there. I live in the great state of Wisconsin!!!! I’m a Texan through and through. Thanks for the great giveaway! I have visited Austin, TX when my husband had to go there for heart surgery. We had some extra time while there to do some sight-seeing & we loved it. I live in Sheridan, WY. THanks for the giveaway! I’ve lived in Mesquite, Kilgore, and Lufkin. I now live in Oklahoma, but I do miss my home state and the bluebonnets! I live in Snohomish, WA. I’ve never visited TX, but I will be in San Antonio this summer! We actually live in a suburb north of Houston for 2 years. I have cousins who live in Texas. Love visiting them! Thanks for an awesome giveaway! One time years ago I visited El Paso. I have lived in Southern California all my life. I went to Texas once for training on my Tin Lizzie quilting machine. I bought it online from a shop near Houston and a training retreat at their site was included. So I took a trip to Texas, all the way from Kentucky where I live. I have visited Texas a few times and really enjoyed being there. One time we drove across Texas and it seemed to take forever! 🙂 I live in Georgia. I like your star block, it is very unusual. Thank you for the chance to win. Yes! I have been to Texas and stayed for a week many years ago but I am from Oregon. I haven’t, but I want to! I live in MI between Ann Arbor and Detroit but closer to A2. I live in Pennsylvania and have never visited Texas. I have driven through the panhandle many years ago on the way to New Mexico. I have lived most of my life in Indiana, center of the state. Hi there, never been to Texas personally, though have enjoyed it via TV shows. I have lived in Michigan since the middle 60’s. Hate the snow but love having all four seasons. Great book!! Have visited Corpus Christi and Houston. My husband is from there, so saw the relatives! We live on the Kenai Peninsula in Alaska. I’ve never been to Texas but I want to go! My daughter did her medical training for the Army in San Antonio. That’s where I would most like to go to see the River Walk. I’m a native Californian, born, raised and thriving here! My comment is above, the mysterious q. Hit enter instead of tab which left off my info! I don’t live in your country but have visited only 2 years ago but no Texas, Hoping to go to Houston next year. I live in Australia. Thanks for a chance to win. I live in Houston, TX. I was born in Port Arthur, TX but grew up in Spartanburg, SC. I got back to Texas as quickly as possible. I have been back here for 37 years this month. The book sound like the series would be wonderful to read. 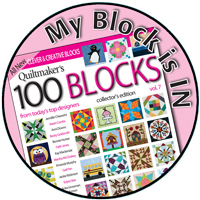 If I don’t win, I will definitely go buy a copy to read and then loan out to my quilting group who also like to read. Thanks. Hello! I have never been to Texas, but I have a few friends who live there. I live in the White Mountains in NH. Thank you!!!! Born, raised, and Live in San Antonio USA, home of the Alamo, and home of the Spurs. Hi, I live in Maryland. We visited Texas about 10 years ago, and plan to visit this spring. My sister and her grown children live near D FW.. your rainbow block is beautiful. I love the banded star! I live in the Texas Hillcountry! A little bitty place called Pipe Creek, NW of San Antonio. I raised my children and now grandchildren here. This is where I taught myself to quilt and will be using the banded star many times. Thank you so much for making this pattern! That banded star is beautiful. would love to make it. Hopefully will make it. I visited Texas way back when Dallas was running on t.v. for the first time. We had a tour of Southfork ranch, where the show was filmed. Had a great time in Texas. I now live just east of Calgary, Alberta , Canada. Thanks for the pattern and the chance to win your prize.